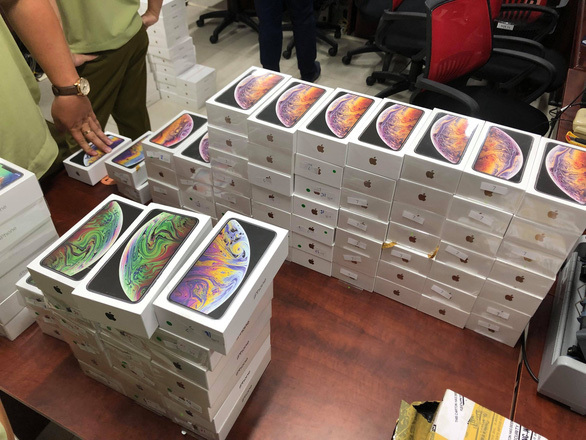 Police and market management officers confiscated 205 Apple devices, suspected to be smuggled into Vietnam, during a search of a car in Ho Chi Minh City on Tuesday. A team of police and market watchdog officers suddenly checked a shipment in a car traveling on Vinh Vien Street in District 10 at 8:30, they said. Two hundred and five iPhones, iPads were found being stashed in the shipment. Among the devices were 104 iPhone Xs and XS MAXs, together with 101 iPad minis, all of which are brand new. Nobody in the car could show documents proving the origin of the devices during the search, officers said. Police and market management officers estimated the devices to be worth VND4 billion (US$172,500). They then sealed the shipment and confiscated it for further investigation.